How can such a unique looking treat not catch your eye? At first I thought it was... well, I didnt know what I thought it was, other than weird. I looked closely and that stuff on the right is Tiramisu Gelato. The awesome thing here is that it's not just coffee and mascapone flavored gelato, it's actually topped with cocoa sprinkles. What an excellent touch. 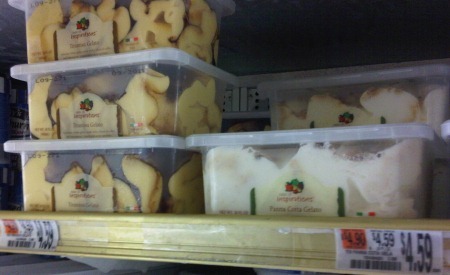 The container to the right is Panna Cotta gelato which is labeled as Authentic italian gelato made with rich sweet caramel flavoring and topped with almond pieces. The other awesome looking flavors are triple chocolate, mint chocolate chip, and the dark chocolate you see above. Note the little Italian flag in the bottom right corner. Our little friend here is indeed authenticate Italian gelato as it has actually been imported from Italy. I'm so bummed that I have neither a spoon to try it now nor a lunchbag to get this stuff back to work. There are also an Armaretto and Peach Melba flavors, but they may be being discontinued. There is no official website either, and this product may be limited to Hannaford, Sweetbay, and Food Lion, the grocery stores which are owned by Delhaize... Yup, it is an inhouse brand, there's more info here. 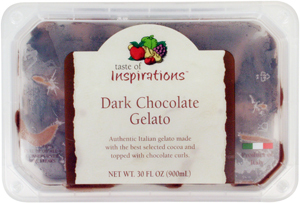 Basically "Taste of Inspirations" is Hannaford's old "On the Go Bistro" premium frozen food line that has been transformed and upgraded to become a part of all Delhaize U.S. supermarkets. The gelato is good but the packaging is horrible. At a dinner party for 8, it took 15 minutes to open the container and everyone tried. Why have a container that cannot be open efficiently?? PLEASE address this issue so that customers do not become disenfranchised. It is a good product but the consumer should not have to feel as though they were breaking into a bank to open it! When you realize how easy it is you feel like a total idiot. It's not the whole piece it's just the top that comes off. Yes to all three of the above entries. I love the tiramisu and at the Hannaford in Enosburg VT; it's only 1.99 for 30 oz. Unfortunately, it's been off the shelves for months. I'm afraid that either they are in the midst of a packaging redesign or the supplier went out of business. Italian gelato for only 1.99...really? I opened the side tab with pliers and then it was easy for future openings. The gelato was disappointing in that it was "gummy" with a lot of fillers. Lived & grew up in Little Italy in NYC and in comparison it's a no go. Talenti gelato is far superior in texture and taste... and worth an extra dollar for quality. Other GIANT products are much better and consistently good quality... but sorry, not this one.